SourceAudio already makes participation in the YouTube Content ID system simpler than ever and we've just taken it one step further: Tap into detailed revenue & performance reporting with our fully-integrated reporting dashboard that's now available to all Admins on the network. 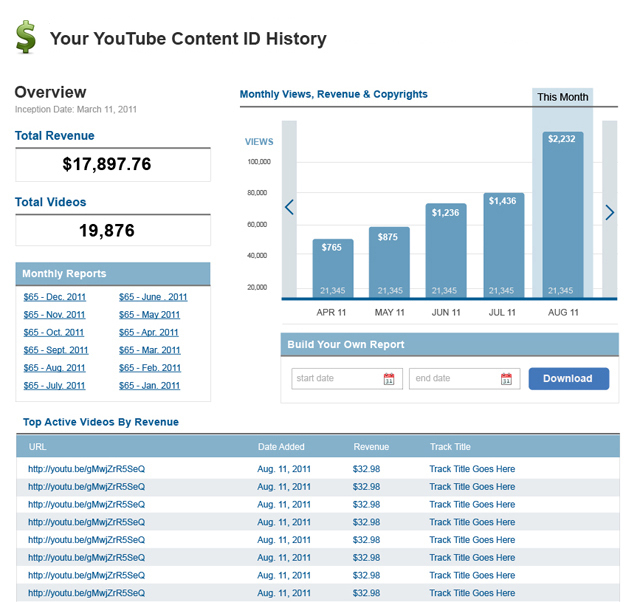 With this new reporting dashboard you can have a live look into your total revenue earned to date, the total number of videos you have claimed in the system, your top performing videos & tracks, and detailed monthly revenue reports. For those of you who are already enrolled in the YouTube Content ID System program through SourceAudio, you can see your reports right now in the new "YouTube Content ID" section of your Admin Panel. You'll have historical performance data in there right now so have a look and pull any reports you need. For those of you who aren't on board with SourceAudio's YouTube Content ID System program you're probably missing out on this great revenue stream for your business. SourceAudio makes file uploading and video claiming easier than ever - just contact Dan or Andrew to let them know you'd like to get started and we'll take it from there. No need to provide updated hard drives or anything on your end - we've got your music files on our cloud servers already so the hard part is already done. We'll sync your music over to the YouTube Content ID System and you can simply sit back and watch your revenue performance through this new dashboard and reporting feature. We know there are several libraries already on board who are earning thousands of dollars each month through this program so if you want in on the action and you'd like to track your performance through this great new reporting tool just let us know and we'll get you all set up!